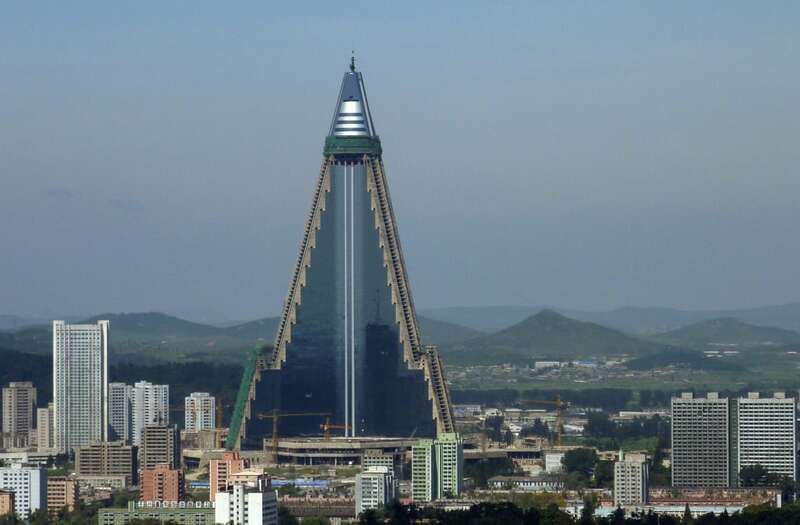 North Korea's Ryugyong Hotel may be getting a new lease on life -- and finally open. The building, also known as the "Hotel of Doom," has been vacant since construction began almost 30-years ago. Last week walls surrounding the empty 105-story structure were taken down, which has led to speculation that construction might begin again, according to FOX News. Two large ramps were unveiled, as well as a new sign, reading "Rocket Power Nation." North Korea's Ryugyong Hotel -- the "Hotel of Doom"
PYONGYANG, NORTH KOREA - SEPTEMBER 08: Tramway passing in front of ryugyong hotel, pyongyang, North Korea on September 8, 2012 in Pyongyang, North Korea. The wall dismantling took place the same week that the rogue nation launched their second intercontinental ballistic missile. Business Insider reports that work on the pyramid-shaped building began in 1987 but stopped in the early 1990's because of the bad economy. Construction started up again in 2008, but then stopped again in 2013. Only time will tell if the "Hotel of Doom" will finally open.